Cooped up in Centre Parcs for the weekend doing the family thang... luckily wife allowed me n my son to bring the bikes, so we could have some boy time while bird n daughter had gurl time. 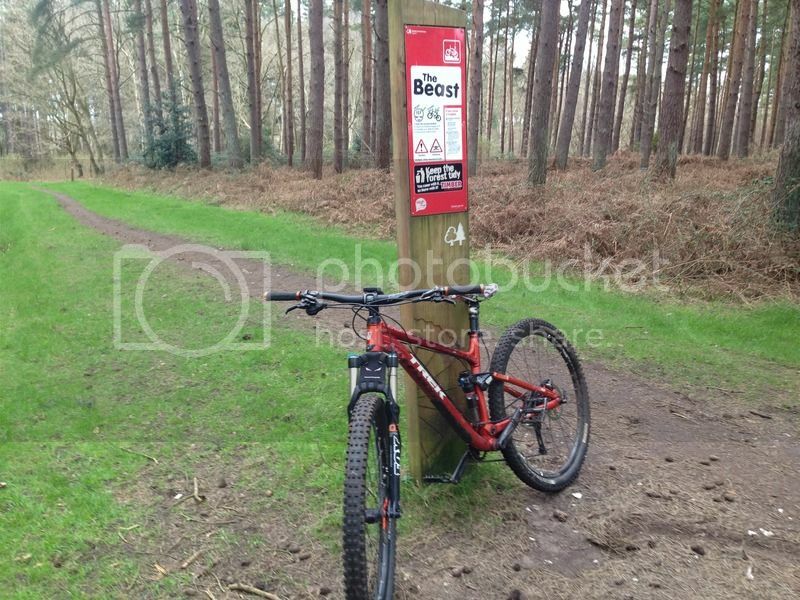 So, just got back from a lap of Thetford's 'Lime Burner' "Red Trail"
Similar to Pines... it's a nice pedal, nothing challenging. The "Red" is barely enough of a challenge to be called a Blue, & I would happily take my non cyclist missus round. Not a place I'd travel to specifically to ride, but it's still good to get out for ½ a day rather than pay through the nose constantly to do stuff here in Centre Parcs. Top tip... don't pay the extortionate fee to park at Thetford. Brandon Country park is only 3miles from Centre Parks, picks up a waymarked family trail that leads to the Reds, (The Poacher Trail) only costs £3 to park all day, the food is cheaper, and nicer too. This "The Beast" is not much of a Beast at all but is the most fun part of it all. Rode here a few years back while on a camping trip. Didn't expect much seeing as it's probably the flattest trail centre in the world (make bedgebury look like the Alps) but was impressed with what they managed to make from it. You find your self sprinting and pumping all the way around with a big smile on your face but nearly puking from the effort of spinning hard by the end of a second lap. Didn't feel it comes alive with out a lot of effort. think your right in saying its a good spot for all levels of riders and definitely a good spot for XC riding. Good shout on the parking, Im sure I remember them charging per hour, which racks up to being on the high side pretty quick. Yeah, my son and I are full of cold and operating on about ¾ lung capacity so pushing it was off the menu, but we could see it was fast if you give it the chance.